Almost a year after planting Swarthmore College’s and Scott Arboretum’s third green roof, the plants have grown together to create a striking tapestry of color. 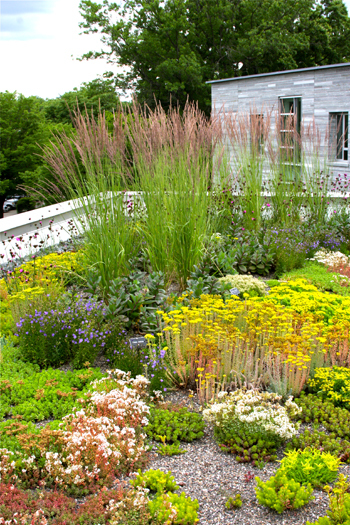 Check out what Jennie Love had to say about our green roof after visiting this summer. 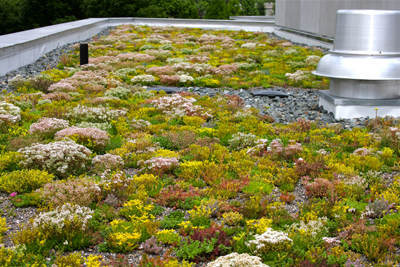 There are two more green roof tours left this season. Mark your calendar for Saturday, September 26 and Thursday, October 22 to experience the parade of colors created by Sedum, Talinum, Delosperma, Campanula, Allium, and Dianthus. We hope to install our fourth green roof on the Wister Education Center and Greenhouse this fall. Stay tuned to Garden Seeds for updates. What times are the tours on September 26 and October 22? Oct. 22 is a Thursday, not a Sunday. The date you have says Sunday, October 22. Did you mean the 25th of October? Thank you for the feedback. Please let me know if we can provide any additional information.